I realized I haven't ever posted about the kitchen. Ours is ridiculously small with minimal counter space. What I do like is the 5 burner stove top--it may not seem like all that big of a deal but you'd be surprised how much an extra burner comes in handy when you like to cook like a mad woman. Decor wise, there isn't much that I did since it's such a small space. My main focus was utilizing every bit of space for storage solutions, including the walls, cabinet doors, and ceiling. 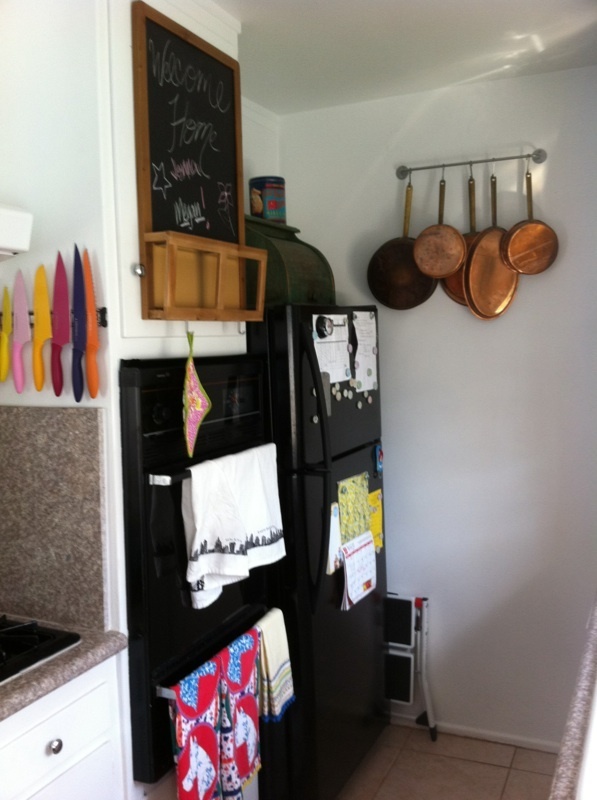 There's a glimpse of the knife rack which is less bulky than a big knife block, and a chalk message board and mail organizer with hooks is mounted on a cabinet door. 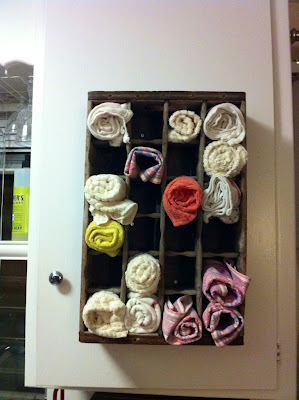 Here, a vintage crate found at a flea market serves as a dish towel/napkin holder. 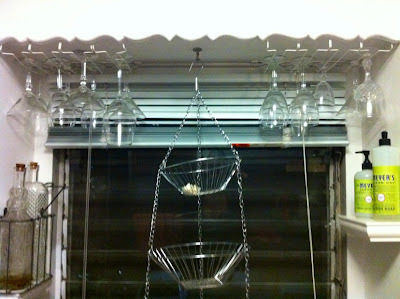 When my Dad came to visit he did many handy things, including putting up these glass racks which are really fantastic. Frees up much needed space in the cabinet as I have a proclivity to purchase and break glasses quite regularly. A wire hanging fruit basket provides more storage for produce. 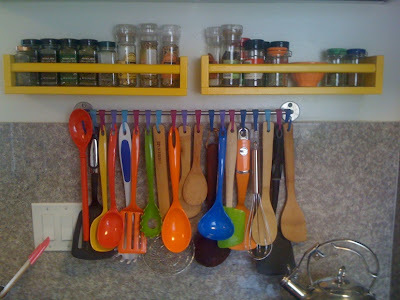 Since there are literally only 2 surfaces in the kitchen, I got a dish rack that fits in one side of the double sinks. Another space saver is the butcher block cutting board that fits over the sink to provide an extra surface when cooking. With minimal storage space, you really have to look to the walls. 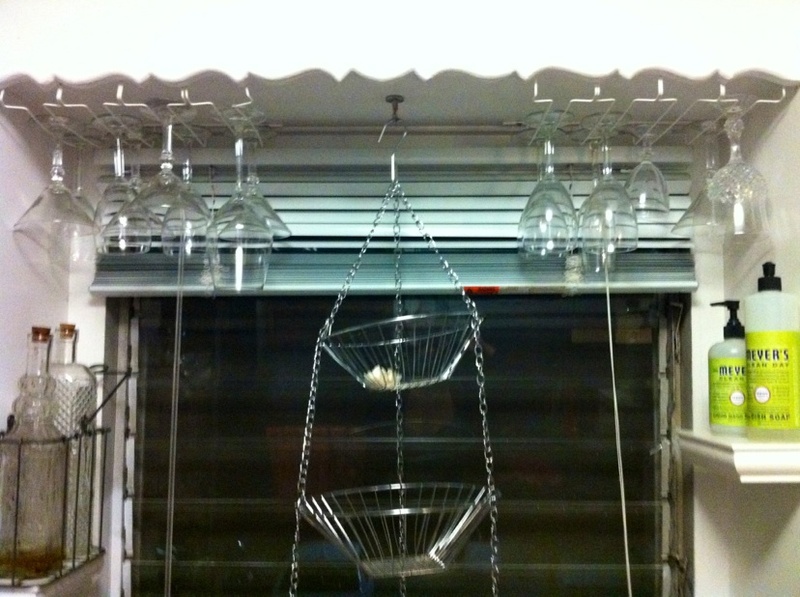 I grabbed a couple of these metal bars and hooks from Ikea. I originally had planned to use them for mugs, but found they were more useful for my copper pots above, (completely amazing looking and great for cooking!) and the ridiculous amount of cooking utensils. Spice racks from Ikea corral all the spices, and hanging over the stove are easily accessible when cooking. Those colored hooks got ditched for some nicer metal ones. Small floating shelves hold homemade herb infused olive oil and dish soap. The drawers in the kitchen are pretty shallow, so all the silverware is kept in mason jars and coffee cans in a wire storage basket. 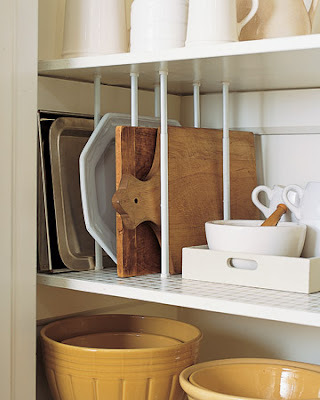 I actually find this really useful to just have the silverware out and handy rather than worrying about jamming it into very shallow drawers. 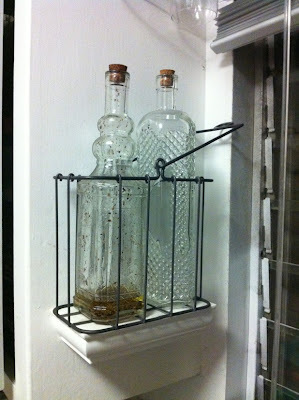 In the pantry, everything is stored in either glass canisters from Ikea (pictured right), mason jars, or coffee cans. I find these canisters SO useful, and they keep everything nice and fresh. Cereal, espresso, pasta, rice, and so on, they're great and come in a variety of sizes. What are some of the ways you work around a small kitchen?